I’ve written about the basic and enhanced features of Diigo (i.e., Webslides) in previous posts. In view of the approaching demise of delicious (still officially a rumor), I thought I’d take some time to describe how to import your bookmarks from delicious to Diigo. STEP 1. Go to your delicious account and sign in; then, click on settings. STEP 2. In settings, select the “Export/Backup Bookmarks” link. STEP 3. Select your export options. You can choose to include your delicious tags and notes and you can choose to export only a subset of tagged items. It’s important to bear in mind that if you’ve duplicated bookmarks in both Diigo and delicious, exporting will override your Diigo notes. STEP 4. When you select “Export,” the file will be saved as an html file. In my system, this file goes straight to my download folder. STEP 5. 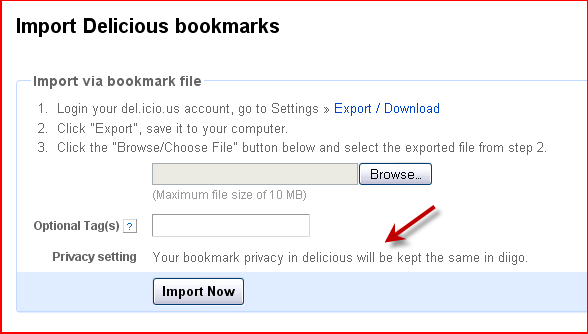 Go to the “Import delicious bookmarks” page in Diigo. It’s important to note that you won’t be able to save the privacy settings you created in delicious when you create your html file and the default state upon importing to Diigo is public. So if you have any private bookmarks, you might want to make them all private at the outset. You can always edit specific bookmarks to make them public later. AN UPDATE: Since I wrote this post, the display now looks like this, so it looks like your privacy settings will be retained. Importing will take some processing time which will vary with the number of bookmarks you have and the number of people trying to import their bookmarks at any give time. You’ll receive an email when its done. Although I’m a Diigo fan, I am saddened by the fact that Yahoo seems to be giving up on delicious, which is quite a good tool in its own right. However, if you are a delicious user, I think you’ll be quite happy after you’ve explored Diigo a bit. I encourage you to check out the various groups and communities on Diigo. There’s even a group for Diigo in Education worth visiting. UPDATE: Don’t panic, the import takes awhile (My 398 bookmarks that I had left in delicious came over sometime on Friday night/Saturday). The folks at Diigo are dealing with a lot of volume. Based on a Tweet, it looks as if they’ve gotten more servers and and are trying new code to try to speed up the process. You can follow Diigo on Twitter (@Diigo) and ask questions. While you’re waiting for the import, start exploring and adding new bookmarks, joining groups, or creating your own. While I was updating this post, I thought I’d point out some Diigo Groups educators might be interested in joining. Another update: Diigo has created a useful FAQ page that describes some of the differences between Diigo and delicious, if you’re still wondering if Diigo is a good solution for you.